Nuisance Wildlife and Unwanted Pests | Receive A Free Inspection. Call 954-945-5050. Do you have nuisance raccoons, rats, mice, or squirrels living in your attic, quietly chewing away the wood fiber in the beams? Are possums or armadillos consuming your plants and bushes? Are snakes slithering around your property, just far enough away that you can’t tell if they’re poisonous or not? Florida Pest Control Center (FPCC) is the reputable South Florida company that provides licensed, insured, and guaranteed safe and humane nuisance wildlife removal. We offer complete wildlife removal services. Many of these wild animals seek shelter in attics, leaving urine and droppings that cause odor and mold problems. Possums find good homes in sheds and can damage gardens and homes. 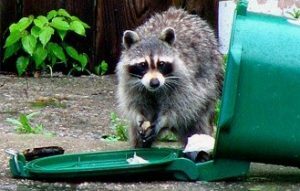 Raccoons get into trash and can destroy attic vents, ductwork, and other entry points of your home. They also chew on electrical wires causing a potential fire hazard. Several animals including bats, raccoons, rats and birds can spread dangerous diseases including salmonella and histoplasmosis. Rats and mice spread numerous diseases through feces, urine, saliva and bites. Additionally, mice can spread the dangerous hantavirus and bats can spread rabies. Armadillos and skunks tear up property, the former looking for food and the latter digging to create places to live under decks. And we all know what happens when the skunk meets the pet dog! Snakes may be poisonous and must be handled with extreme caution. Birds such as pigeons can be noisy, produce terrible odors, and can spread very serious diseases. FPCC specializes in removing all these wild animals in a safe and humane manner. Rats, shrews, and mice can easily get into your home through tiny holes as small as ¼ inch in diameter. Since these animals chew on wood and other fiber, they can damage your home and furniture. These animals digest fiber quickly and release large quantities of feces, spreading bacteria and parasites that can contaminate your home. Florida Pest Control Center specializes in animal trapping and rodent control services. Rodent-proofing structures is an essential component to effectively deter potential rat, mouse, and other nuisance wildlife infestations. Our team will inspect the premises to find entry points and holes that allowed them to penetrate your attic or garage. Whether your home is new or old, there are typically many holes or cracks where these rodents enter. Our team of professionals will seal all entry points to ensure rodents cannot return and to prevent any other animals from entering. Florida Pest Control Center offers full inspections, monitoring and proofing. For more information or for a free estimate, please visit us at Florida Pest Control Center (FPCC) or contact the Florida Pest Control Center (FPCC) at 866-697-3555 today. Florida Pest Control Center (FPCC) services are licensed, insured, and guaranteed. Florida Pest Control Center (FPCC) employs comprehensive, state-of-the art technologies, chemical, and non-chemical treatments to eliminate pest problems in residential homes, businesses, hospitals, medical facilities, group homes, and apartment and condominium buildings. Our highly trained professionals provide a fast, complete solution to your ants, ticks, mosquitoes, termites, bed bugs, birds, rodents, and other pest infestations.